Tag line: "Unleash the terror"
By all appearances, Donna (Dee Wallace) and Vic Trenton (Daniel Hugh-Kelly) are a happily married couple, with a son (Danny Pintauro) who’s as cute as a button and a spacious house in the suburbs. But looks can be deceiving; for a while now, Donna has been carrying on an affair with Steve Kemp (Christopher Stone), her husband’s tennis partner. Hoping to put things right, Donna ends her relationship with Kemp and confesses her infidelity to her husband. Scheduled to go on a 10-day business trip, Vic tells Donna he’ll use the time to contemplate their future together. Left on her own, Donna takes her car, which has been acting up, to Joe Camber’s (Ed Lauter) garage for service. But instead of finding a helpful mechanic, she comes face-to-face with Cujo, a St. Bernard that, after being bitten by a bat, has been infected with rabies, leading to a standoff that threatens both Donna’s life and that of her young son. 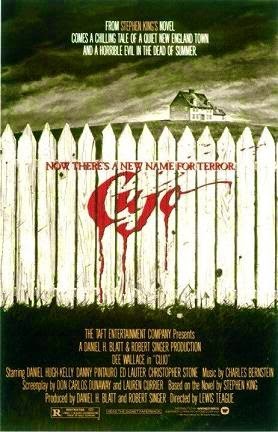 Based on a novel by Stephen King, Cujo is a movie that gets better with each successive viewing. First and foremost, it’s a beautifully shot film (Jan de Bont, who would go on to direct Speed and Twister, was the Director of Photography). The opening scene, where Cujo chases a rabbit through the woods and inadvertently stirs up a cave filed with rabid bats, is executed perfectly (in one or two instances, the camera follows the rabbit during his frenzied run, getting as close to the animal as possible). The performances are also exceptional. In the early scenes, Dee Wallace does a fine job conveying her character’s inner turmoil, wrestling with the reality that her ill-conceived extramarital affair is destroying her marriage. This confusion slowly gives way to terror when she finds herself at the mercy of a monster. Daniel Hugh-Kelly is also strong as the loving father forced to deal with his wife’s infidelity, but as good as the adults are, I was more impressed with Danny Pintauro, who plays terrified better than most child actors I’ve seen. On top of it all, the entire second half of Cujo is wall-to-wall tension, which it manages to generate despite the fact much of the action takes place in a single location. Back when I covered another King adaptation, John Carpenter’s Christine, I mentioned I don’t find killer cars particularly scary. Going into Cujo, I felt the exact same way about St. Bernards. But thanks to the expert work of everyone involved, coupled with a dog that looks positively terrifying (the bite wound on Cujo’s nose, which he sports in the movie’s initial scenes, was disturbing in its own right, but it’s how he looked at the end of the movie that’ll stay with you), Cujo ranks up there with Christine, The Shining, Creepshow and Pet Semetery as one of the best Stephen King movies to emerge from the ‘80s.